I decided I’d rather spend $23 and practice my locksmithing skills. This is an article describing how to do the same thing, while hopefully avoiding a few of the mistakes I made in the process. 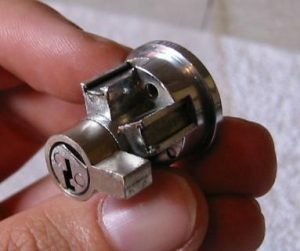 Tip: Take a look at this page in general (lock picking) and particularly page 5 from that series for some good visualizations of how a pin-and-tumbler lock works. 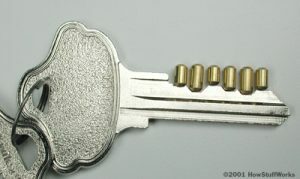 This is the type of lock used in the seat of the R100 (and probably many other similar vintage Airheads). While the specifics of installation, removal and pin-access may not apply to other locks on the bike (or in general), the rekeying steps can easily be applied to other locks. Without any instruction, it took me about 30 minutes to do the actual rekeying, having spent 15 minutes beforehand, removing the lock. Reinstalling the lock took about 10 minutes, but would have taken less if I’d kept the seat on (I wanted to take pictures). I think it’d take most people 30-45 minutes to do the whole thing if you read through and understand these instructions. I’ll describe this in a step-by-step method, referring to pictures as appropriate. Click on pictures to enlarge them. Comments about what I did are in italics. 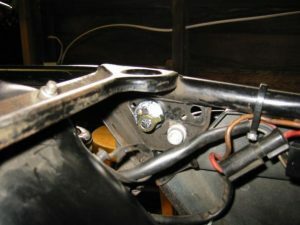 The seat latch mechanism is attached to the bike by way of two long screws that thread into the same plate that holds the side handle and the latch button. The heads aim back towards the tire/center of the bike. It’s easiest to take off these screws with a very short #2 Phillips head screwdriver, but a longer one will do. Just unscrew them, and the latch box and cover will come off in your hand. The lock is secured to the bike with a metal ring, that’s then attached to the body lock with a single screw. The screw is a #1 Phillips screw, and is best taken out with a fairly short screwdriver again. 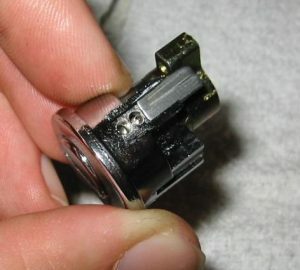 Once the ring is removed, the lock body should fall out pretty easily. I accidentally messed up the small screw on my lock by using too large a screwdriver. It eventually came out, but was pretty well unusable. Get together a large plastic bag, a pair of pliers and a small screwdriver or similar prying instrument. The lock has two “risers,” which contain the springs and pin followers. 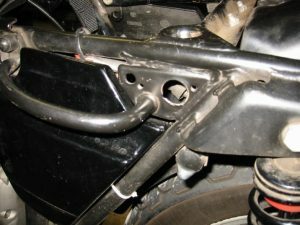 Each riser is covered by a sliding cover which holds in the pins, followers, and springs. 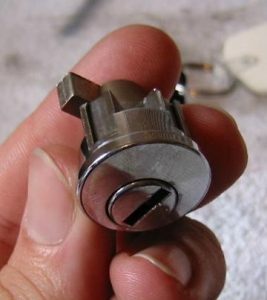 The pins move in the cylinder when the key is turned. Check the sliding covers on both risers, as one may move more easily than the other. If you have one easier slider, that’s the one you want to work with. Turn the key to that riser and pull it out. If you don’t have one easier sliding cover, just pick one of them at random. Do Not remove the cover yet. Both the sliding covers on my old lock were stiff, but one of them on the new lock was really easy to get off. Your mileage may vary. 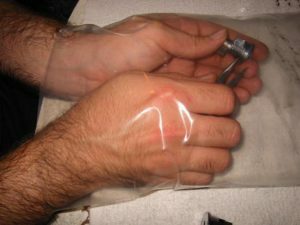 Make sure the plastic bag is big enough to fit both your hands into and still work. Put the old lock into the bag, and using whatever tools work for you (I used a pair of pliers) remove the sliding cover. When you get the cover off, the springs will all fly out, and you’ll be really happy you were working inside a bag instead of out in the open. Once you’ve got the cover off and the springs out, the pins and followers will come out by tapping the lock body against the table. Try to determine which order they come out in, so you can put them into the new lock correctly the first time. If you can’t keep track of it, you can line them up against the key and see which order works, like this picture of a key with tumblers. At this point, you have your old lock in pieces, and the new lock still functional with its correct key. It’s time to take the new lock apart, and remove any chance of it working with its original key. Follow the same steps again, with the bag and the sliding cover removal. Before you begin, though, tape the rotating cog on the back end of the lock in place so it can’t move. The reason for this will become apparent in a moment. Once you have the original pins out of the new lock, set them aside, but keep the new springs and followers (might as well keep as many new parts as possible). The new pins are not going to do you any good, unless you can be certain that a new pin is exactly the same size as one of the old pins. Important: If you were to now rotate the cylinder to the other position, the pin followers would slide down into the holes left by the now-missing pins. If you turned the cylinder at this point, you’d bend the springs beyond repair and possibly damage the cylinder bore. The only way to extricate yourself from the mess would be to remove the other sliding cover, take out the followers and springs, and then replace them once the cylinder was back to the original side. I accidentally did this, and wasted 20 minutes getting it back to where I had started. That’s why you want to tape the cog in place. Put the old pins in the new lock, and then the new followers on top of them. Insert the key into the lock, and push the pins down with a small screwdriver or piece of wire. If you have the pins in the right places, the tops of the followers will all line up, and the lock should rotate (as long as the pins are in place, it’s safe to rotate the cylinder). If the lock doesn’t rotate, you need to figure out which pins are out of place and get them in the right order. Once the pins are all in place and the lock rotates (remember to press the pins down for the rotating test, or you’re not really testing it), you can put the lock back together. This involves a good deal of patience, four mischevious springs, and the sliding cover. Insert the spring into the furthest back pinhole. You’ll want to find something narrower than the channel that holds the cover that you can use to press down the spring. I used the nose of a pair of pliers. Press the spring all the way down into its hole, and slide the cover over it — moving your spring compressor out of the way as you do so. You shouldn’t see the spring at all once the hole is covered. Repeat this process for the remaining three holes. The final hole (furthest forward) may require a different pressing implement — I used a small flathead screwdriver. Once the cover’s on and seems to be ok, try your key. If it still works, you’ve got a shiny new lock. If not, repeat the pin removal process (don’t forget the plastic bag) and rearrange the pins until it works. I took time to clean all the dirt and oil off my latch box and cover and repaint them, since the lock I ordered would take a day or two to arrive. Before installing anything, lubricate all the bits, as you’re unlikely to be inside this part of your bike again any time soon. I just used WD40 on the latch and button, and graphite powder inside the lock body. Probably some variety of grease would have been a better choice for the latch. The ring screw on my lock was particularly stiff, and seemed to benefit from a good shot of oil. Insert the lock in its hole, from the outside. 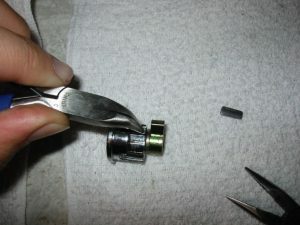 Slip the ring onto the lock from the inside, and rotate it so that V shaped notch fits between the pin risers. Screw it into place. 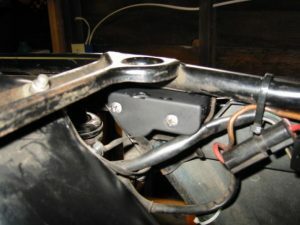 Put the latch box in place from the inside, so that the seat latch button sticks out through its hole near the handle. Make sure that the spring in the latch box is set so that it will bear against the cover, and press the latch button out. Then, put the cover on, and tighten down the two screws. At this point, you should have a fully functional seat lock again. Try it out. Rejoice. Rest easy in the knowledge that your tools will finally stop dissappearing out of the underseat tray.